The gyroelongated triangular cupola is the 22nd Johnson solid (J22). It has 15 vertices and 20 faces (16 equilateral triangles, 3 squares, and 1 hexagon). The gyroelongated triangular cupola can be constructed by attaching a hexagonal antiprism to a triangular cupola (J3), thereby lengthening it. The gyro in the name refers to how the bottom hexagonal face is gyrated with respect to the hexagonal face of the constituent triangular cupola. 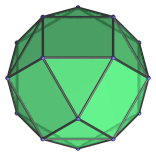 Adding a second cupola to the other side of the hexagonal antiprism produces the gyroelongated triangular bicupola (J44). Side view, with many coincident edges.